With Memorial Day behind us and July 4th on the way, it’s easy to get swept up in all things red, white, and blue. Luckily for everyone, there are some GREAT repurposed / upcycled patriotic project ideas out there- and I’m happy to contribute some myself. I hunted down some terrific ideas from my blogger-friends, and I’m pretty sure you’ll be inspired…and quite possibly begin to whistle Yankee Doodle while you work. It’s easy to show love of country when you’re showing love of Earth by repurposing your décor, eh?? Cheers to you this July 4th! Thank you so much, Debbie, for “lending” your project to me for inclusion- it’s really fantastic!! All such fun ideas! I love the flag made with scraps of laces and trims, so pretty! Thank you!!! Yes, Flamingo Toes is one of my favorite blogs- she does amazing work!! Wow, what a creative collection of fabulous red, white, and blue projects. Thanks so much for including my rustic flag with starfish. A wonderful collection of red, white and blue projects so perfect for the season. This is a an awesome collection of thrifted patriotic goodness! I love them all in each of the fun ways. Thank you for including my bunting! Thanks for including my Repurposed Window Flag in such a fun roundup! So many great ideas here…….loved the flag in the window frame. Love seeing all these repurposed projects! My little suitcase is in some great company! Thanks for including us! What creative ideas! I just love the rulers repurposed as a flag! Great ideas! I love red, white and blue! Wow! There are some great ideas here. I really love the flag with the starfish stars. Thank you for sharing on Family Joy Link Party. Have a great week! Aren’t those starfish brilliant?? Thank you for checking them out! Love love love!! These are all so fun! I need to start collecting yardsticks – that flag is too fun! Thanks for including my Ribbon Flag friend!! 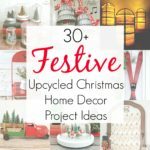 Wow, so many easy projects to choose from, love this!! It’s almost hard to pick a favorite. Thanks for sharing this at the Dishing It & Digging It Link Party. Have a great week Sarah! You are so talented! Your patriotic wreath over on my Tweak It party is garnering a lot of praise! Such fun ideas. Makes for some amazing fourth of july crafts. Thank you so much!! It was definitely fun to gather all those awesome ideas. You have the best ideas! I don’t usually decorate for the 4th but we do hang our flags. Such a great round-up. Makes you want to salute the flag! Visiting from Vintage Charm. Sarah, what great ideas. I can’t decide which one I like most. Thanks for sharing at Your Inspired Design Link Party #39. Right?? Lots of inspiration here! There are enough ideas here to keep me busy for a long time, thank you. Oh, wow so many great ideas! Love the bowl covers, love that flag from yard sticks – heck I love so many of them! Thanks for sharing this with us at Throwback Thursday this week! I love all of these, but I NEEEEEED some of those bowl covers! We love hosting BBQs and those would be a perfect way to keep things covered. Thanks for sharing at Throwback Thursday! I love the features! Inspiring projects! Thanks so much for sharing at Funtastic Friday. Sarah these are really, really great projects. All are so full of creativity and whimsey. I especially liked the vignette with the buttons. Thanks for providing us with lots of Sweet Inspiration.